Hubble Space Telescope view of the galaxy UGC 9391, which contains Cepheid variable stars and supernovas that scientists studied to calculate a newly precise value for Hubble's constant. The universe is expanding 5 to 9 percent faster than astronomers had thought, a new study suggests. "This surprising finding may be an important clue to understanding those mysterious parts of the universe that make up 95 percent of everything and don't emit light, such as dark energy, dark matter and dark radiation," study leader Adam Riess, an astrophysicist at the Space Telescope Science Institute and Johns Hopkins University in Baltimore, said in a statement. This Hubble Space Telescope image shows Cepheid variable stars (circled in red) and a Type Ia supernova (blue “X”) in the galaxy UGC 9391. Astronomers studied these and other “cosmic yardsticks” to calculate how fast the universe is expanding. These are two different types of "cosmic yardsticks" that allow scientists to measure distances across the universe. Cepheids pulse at rates that are related to their true brightness, and Type Ia supernovas — powerful explosions that mark the deaths of massive stars — blaze up with consistent luminosity. This work allowed the team to determine the distances to the 300 supernovas, which lie in a number of different galaxies. Then, the researchers compared these figures to the expansion of space, which was calculated by measuring how light from faraway galaxies stretches as it moves away from Earth, to determine how fast the universe is expanding — a value known as the Hubble constant, after famed American astronomer Edwin Hubble. The new, unprecedentedly precise value for the Hubble constant comes out to 45.5 miles (73.2 kilometers) per second per megaparsec. (One megaparsec is equivalent to 3.26 million light-years.) Therefore, the distance between cosmic objects should double 9.8 billion years from now, the researchers said. 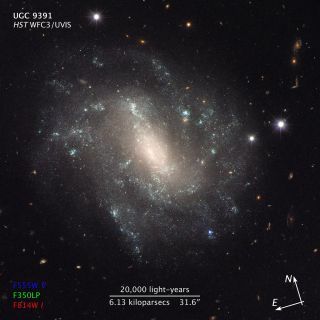 The new figure is 5 to 9 percent higher than previous estimates of the Hubble constant, which relied on measurements of the cosmic microwave background radiation — the light left over from the Big Bang that created the universe 13.8 billion years ago. There are a number of possible explanations for this discrepancy, study team members said. Illustration showing the three steps astronomers used to measure the universe's expansion rate to an unprecedented accuracy, reducing the total uncertainty to 2.4 percent. For example, the mysterious force known as dark energy, which is thought to be behind the universe's accelerating expansion, may be stronger than astronomers had thought. It's also possible that "dark radiation" — an unknown, superspeedy subatomic particle or particles that existed shortly after the Big Bang — could be playing a role that hasn't been taken into account, the researchers said. Enigmatic dark matter, which is thought to be four times more abundant than "normal" matter throughout the universe, could also have some weird and unappreciated characteristics. Or maybe there's something important missing from Einstein's theory of gravity, the researchers said. In short, there's a lot of work left to do before astronomers can fully appreciate the meaning of the new results. "We know so little about the dark parts of the universe; it's important to measure how they push and pull on space over cosmic history," study co-author Lucas Macri, of Texas A&M University, said in the same statement. The new study has been accepted for publication in The Astrophysical Journal.